One of the most adulated and popular incarnations of Vishnu, Rama is referred to as Maryada Purushottama or the Perfect Man within Hinduism. The doctrine of the avatara has had an indelible impact on Hindus for it invariably means that God manifested Himself in a form that could be appreciated by the masses. If there is one aspect of Rama’s enigmatic persona which distinguishes him from all other deities it is his lila or divine play, states the Bhagavata Purana. He is most often depicted as a standing figure in princely attire, with an arrow in his right hand, a bow in his left and a quiver on his back. A Rama statue is usually accompanied by those of his wife Sita, brother Lakshmana, and the legendary monkey devotee Hanuman. The seventh incarnation of Lord Vishnu, Rama is said to have taken birth on earth to annihilate the rampant evil forces of the Treta Yuga. Ravana, the demonic ten-headed king of Lanka having pleased Brahma by his austere penance, attained the boon of being invulnerable from the wrath of the gods and now ruled the heavens, earth and the netherworlds. All deities ardently entreated Brahma to save them from the painful suffering of his tyranny. Brahma disclosed that arrogant Ravana had assumed only gods could subdue him and did not include man amongst those who could overpower him. When the gods reached Vishnu, the preserver and prayed for deliverance, He assured to descend as an avatara and kill Ravana by incarnating as the eldest son of Kosala's king Dasaratha. Rama is born as the eldest son of Dasharatha, king of Ayodhaya, and Kaushalaya. He is the husband of Sita, an incarnation of Lakshmi, His eternal consort symbolizing perfect womanhood. Sita was found by king Janaka of Mithila while ploughing a field. Ananta Sesha (the thousand-headed snake, a symbol of eternity on which Vishnu sleeps throughout periods of dissolution of the world) is said to have incarnated as Lakshmana to stay by his Lord's side on earth. In Rama the idyllic Avatar, Lord Vishnu incarnates as the central character in the Ramayana, the highly celebrated Hindu epic. Ramayana, literally means the march or ayana of Rama in search of human values. The narration is woven around a myriad of topics including war, love, brotherhood, ideal king, son, father and man, written by the ancient Sanskrit poet Valmiki. "No language can be purer, none chaster, none more beautiful, and at the same time simpler, than the language in which the great poet has depicted the life of Rama," affirms Swami Vivekananda about the Valmiki Ramayana. Later on Tulsidas' outstanding retelling of the Sanskrit epic in the vernaculars as the Ramcharitmanas, greatly enhanced the popularity of Rama as a Hindu God, giving rise to various devotional groups. The epic poem ‘Ramayana’ is composed of rhyming couplets called slokas which are compiled into individual chapters wherein a specific intent is related. The chapters are further grouped into books called kandas. King Dasaratha performs a sacrifice to obtain offspring by pleasing the gods and gives the sacred nectar to his three wives Kousalya, Sumitra and Kaikeyi. On the night of the ninth day after Amavasya, Rama is born in the city of Ayodhya, capital of the ancient kingdom of Kosala centered within the modern state of Uttar Pradesh in India. Rama was the prince of the Suryavansha or Sun Dynasty. He is the eldest brother to Bharata, son of Kaikeyi and Lakshmana and Shatrughna. The Ramayana describes the relationship between the brothers as intensely loving and devotional, although Rama and Lakshmana share a special, inseparable bond, while Bharata is especially close to Shatrughna. Dasaratha's main affections are affixed upon Rama. Sage Vishwamitra takes the two princes, Rama and Lakshmana, to the Swayamavara of Sita. While attempting to string the bow of Shiva, Rama breaks it into two. Parashurama encountered Lord Rama when he heard of the unprecedented breaking of the bow, acknowledging him as his superior in a trail of strength that involved stringing Vishnu's bow. After Rama weds Sita, the entire royal family and Ayodhya army begin their journey back. The section details the brothers’ education with Rishi Vasishtha, Rama's slaying of Tataka a demoness of the forest, his killing the demon Subahu who defiles the yajnas of Vishvamitra and his deliverance of Ahalya. The Ayodhya Kanda narrates Rama's life in Ayodhya until his banishment. When Dashratha decides it is time to coronate Rama as the King of Ayodhya, Manthra, Kaikeyi’s maid, instigates her to ask for two wishes. One that Bharat should be made king and the second is to send Rama for a 14 years exile in the forest. Rama is the perfect son who for the sake of his father’s honour abandons his claim to Kosala’s throne. His wife Sita and brother Lakshman pained at the separation decide to join him in the exile. Sumant, the charioteer, takes them to the forest and they meet Nishadraj who ventures with them on a boat to Prayag, confluence of the Ganges, Yamuna and Saraswati. On journeying to the central Indian forest region the trio meets sages Bhardwaj and Valmiki. Rishi Valmiki advises Rama to stay on in Chitrakoot for the rest of their banishment. Rama's younger brothers, Lakshmana, Shatrughana and Bharata strongly complement his piety, virtue and strength. Bharata acclaimed for his devotion to his elder brother and dharma is distinct from Lakshmana as he is left on his own for fourteen years. But he denies self-interest throughout this time span, ruling the kingdom only in Rama's image. The Aranya Kanda is woven around Rama's life in the forest. During the course of his stay Ravana, the Rakshasa monarch of Lanka kidnaps Sita. Rama now sets out in the arduous search of his wife, which tests his personal strength and virtues. Rama and Sita are the protagonists in one of the most famous love stories of all time as incarnations of Vishnu and Laxmi. When Rama is banished from the kingdom, he attempts to convince Sita not to join him in a dangerous and arduous existence in the jungle, but Sita asserts that it is an essential duty of a wife to be at her husband's side come good or ill. Rama is protective and caring towards Sita throughout the exile. When Sita is kidnapped by Ravana, she protects her chastity assiduously, and survives over a year in captivity, unfazed in her resolve despite Ravana's persistent courting and threats. Meanwhile Rama, not knowing the abductor often succumbs to despair. Sita knows that it is in Rama's destiny to fight to rescue her and she refuses to be saved by Hanuman who sights her in the Sundara Kanda. Lakshmana, believed to be Ananta Sesha Incarnate, is always by Rama's side. The fourth is the Kishkindha Kanda centered around Rama's stay at Kishkindha, the capital of his monkey ally, Sugriva; Rama's trove of virtues attract powerful and devoted allies such as Hanuman and Sugriva with whose help he rescues Sita. When Rama and Lakshmana begin the desperate search to find where Sita had been taken they come across the magical eagle Jatayu, who is dying and discover that a rakshasa was flying away with a wailing, Sita towards the south. Jatayu had flown to the rescue of Sita, but due to his age now dies in Rama's arms. Terrified Sugriva is being hounded by his own brother, king Vali and Rama promises to kill Vali and free Sugriva of the terror. Sundara Kanda enlightens us on Rama's passage to Sri Lanka, depicting the adventures of Hanuman. Sundara Kanda is the only book of the Ramayana where the protagonist is not Rama but mighty Hanuman. His selflessness, mighty strength and dedicated devotion to Rama is explicitly expressed here. Sundara Kanda literally means beautiful book and several joyous events take place during the course, mainly on account of Hanuman’s heroics. The narrative covers about three days. It describes Hanuman’s search for Sita, the heroine of the epic kidnapped by the vicious demon Ravana and confined to a small garden within the palace. Hanuman, Sugriva's minister, is the first to discover that Sita was taken to Lanka, and hands Rama's ring to Sita, as a mark of Rama's love. In spite of being captured, he delivers Rama's message to Ravana to instantly release Sita, and on his tail being lit, sets Lanka on fire. When Lakshmana is struck down Hanuman flies to the Himalayas to fetch the sanjeevani medicinal herb. In the Yuddha Kanda or Lanka Kanda Rama finally wages a colossal war against Ravana, slays him in battle and rescuing Sita, returns to Ayodhya. Before the onset of war, Vibheeshana, Ravana's youngest brother comes to join Rama. He refuses to defend his evil ways and inspired by Rama's compassion helps him and the Vanaras overcome black magic and mystical weapons. On triumphing, Rama crowns Vibheeshana as the king of Lanka. Rama endorses his dedication to dharma when he offers Ravana a final chance to make peace by immediately returning Sita and apologizing to both Rama and Sita, but Ravana refuses. The Vanaras fight the rakshasas with devotion to Rama's cause. At the end of the war, Rama worships Brahma, who restores life to the millions of fallen Vanaras. In the grand finale of the battle, Ravana devastated on losing his sons, brothers and millions of warriors, makes full use of the boons of Siva and Brahma, and magical warfare. After a long and arduous combat, Rama successfully decapitates Ravana's central head, but an ugly head, symbolic of Ravana's evil powers arises in its place. The cycle continues but Vibheeshana reveals Ravana had obtained amrita the nectar of immortality stored in his stomach. Upon the advice of Agastya, Rama worships Lord Aditya, the Sun. Rama fires the Brahmastra, the most powerful weapon that enters Ravana's chest/stomach and destroys the store of amrit, killing him finally. After declaring Vibheeshana as the next king of Lanka, Rama asks the new king and the surviving rakshasas to properly cremate their dead king, who he acknowledges worthy of respect, despite his evil ways. The war ends, coinciding with the end of Rama's exile. Rama returns to a joyous Ayodhya. He forgives Kaikeyi now repentant of her deeds. The next day, Rama is coronated as the King of Ayodhya. Initially asking Lakshmana to become the yuvaraja he designates the position to Bharata, who has had fourteen years of experience as the ruler of Ayodhya. In the Uttara Kanda, Rama banishes his wife Sita, even as she is pregnant, asking Lakshmana to deliver her safely to Rishi Valmiki’s ashram. Some subjects in Ayodhya believe that Sita is unchaste due to her long captivity in Ravana's city and she goes through the Agni Pariksha. She begs Lakshmana to build her a pyre to end her life, as she could not live without Rama. Sita walks into the flames but completely unharmed, glows radiantly from the centre of the pyre. Rama never doubted her purity but explains that worldly people would not have accepted her as a queen if she had not passed this Agni pariksha before the onlookers. Agni invariably destroys the sinful but does not touch the pure. Another version in the ‘Ramcharit Manas’ states that Rama had known Sita was going to be abducted by Ravana so he entrusted her to Agni Dev. Sita had left behind a shadow, or replication which was abducted by Ravana. The divine play of Agni Pariksha was to retrieve the genuine Sita from the temporary care of Agni Dev. The Agni pariksha fails to convince these critics, but Rama, because of his dharma as a king, decides to banish Sita. In the epic Rishi Agastya states that Vishnu was cursed by a sage whose wife was killed by Vishnu for sheltering his enemies. Thus Rama, Vishnu's incarnation, must live the rest of his life without Sita. Rama performs the holy Ashwamedha Yagya or sacrifice establishing religion across earth. Sita finally goes back to mother earth and their two sons Luv and Kush come to Rama. “The embodiment of truth, of morality, the ideal son, the ideal husband, and above all, the ideal king", raves Swami Vivekananda about Lord Rama. 1. At a time when kings usually had more than one wife, Rama ideally had a single wife. After Sita was banished, he did penance with a gold statue of Sita. The Balakaanda of the Valmiki Ramayana states that Rama and Sita resided in each other’s heart. 2. In the Rama Avatara duty ranks foremost and joy later. Rama conducted himself as if He was subject to Maya because He lamented over the loss of Sita and was in deep anguish. In this context, Rama is described as ‘Maya manusha vigraha’ or Maya in human form, being provoked to take up arms against evildoers. 3. But He is truly the very embodiment of Sathya and Dharma or truth and righteousness to promote the well-being of the temporal plane. Rama manifested to fulfill his dharma as Vishnu’s incarnation in this world; protect Dharani or earth, go on to save His Dharma Patni or consort, Sita and finally establish righteousness. 4. Rama always kept his promise at any cost. For example, he gave up his rightful claim to the throne, and agreed to go into exile for fourteen years, to fulfill the vow that his father had given to Kaikeyi, one of King Dashratha's wives. This is in spite of the fact that Kaikeyi's son, Bharat, begged him to return back to Ayodhya and said that he did not want to rule in place of Rama. But Rama considered his dharma as a son above that of his own birthright and ambition. There are many examples of Rama's promises which he kept. Most important are the vows to sages to save their lives from demons, recovering Sugreeva’s kingdom and enthroning Vibhishana as the king of Lanka. 5. 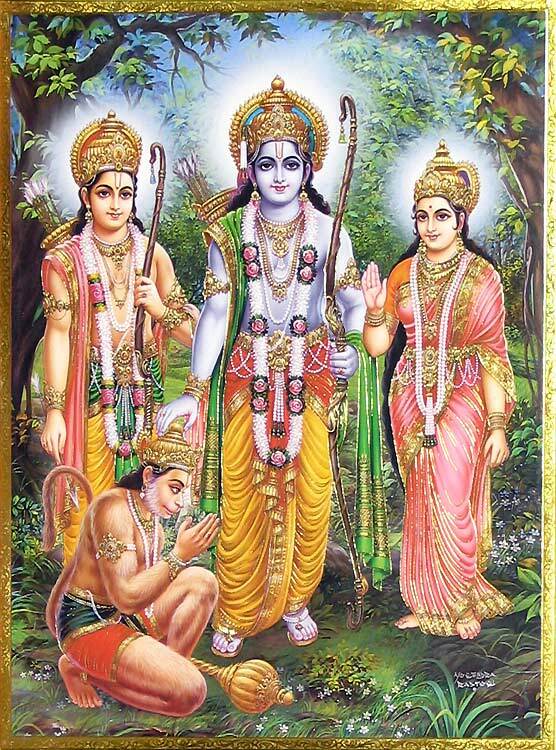 A friend par excellence, Rama shared a close relationship with his associates from all walks of life. Nishad-Raj Guh, King of Nishaads (a caste hunting birds), Sugreeva, the Vanara king and Vibhishana a Rakshasa, were all dear to him. Renowned as Ram Rajya, his reign for eleven thousand years abounds with bliss, peace, prosperity and justice. Highly revered for his eternal compassion, valour and devotion to religious values and duty, the legend of Rama is deeply influential and popular in the Indian subcontinent and South East Asia. Rama's rule presents to modern Indians an era when God as a man reigned over the world amidst unprecedented prosperity. There are no sins committed by any of his people. Attentive and always accessible to his people, Rama is highly revered by all as the perfect symbol of moksha or salvation, inspiring humans for countless succeeding ages. The characters and incidents in the Ramayana are showcased as ideals in mundane life, bonding the people of India, regardless of caste and dialect. Be it as a manifestation of God or simply as a legendary hero of folktales, Rama is an immensely revered inspirational figure to people across the Indian subcontinent and South East Asia. He has an impact across Western civilization as well, where Hindu epics are gaining recognition. Rama's day and time of birth, as well as marriage to Sita are celebrated by Hindus across the world as Ram Navami. The festival falls on the ninth day of a Hindu lunar year, or Chaitra Masa Suklapaksha Navami. Vijayadashami also famed as Dussehra is celebrated to honour the triumph over Ravana and the rakshasas by Rama because of his innate divinity. During this period the Ram Leela is performed with great fanfare in many villages, towns and cities of India. Diwali, the festival of lights, rejoices Rama's return to Ayodhya and his coronation. The latter two are the most important and popular festivities in India and for Hindus across the world. Gandhiji was deeply moved by Rama's strict adherence to satya or (truth) and dharma or righteousness despite several hardships. On religious occasions, Hindus often chant the name of Rama, Ram Naam Japo to express their devotion to God. While cremating the dead, Hindus invariably recite Ram Nam Satya Hai (Rama's name is Truth) showcasing his significance on the earthly plane. Ravana represents ahankara or the ego and his ten heads the ten senses. To kill the ten-headed Ravana is to slay egoism and curb the senses. Recovering Sita is to attain peace which the jiva or individual has lost on account of his desires. To achieve wisdom is to have darshana of Rama or the Supreme Self. He who crosses this ocean of moha or worldly attachment and destroys the demons of raga and dvesha is said to be an ascetic united with peace, resting in the Atman, and enjoying eternal bliss. Sri Rama symbolizes good or Sattva; Ravana stands for evil. Eventually Sri Rama triumphs in the war between Sri Rama and Ravana because of his innate divinity. The victory endorses the doctrine that good always conquers evil.